In yet another effort to contain medical spending, seemingly everyone in the industry is looking at how physicians, hospitals, and other health care providers are paid. Slowly but steadily, many are shifting from fee-for-service to a fee-for-value reimbursement model. 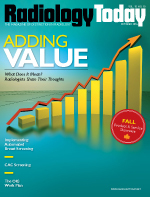 The thinking is that value-based reimbursement is at least part of the solution. Value-based reimbursement is not new for radiologists, says Shawn McKenzie, president and CEO of Ascendian Healthcare Consulting in Roseville, California. About 15 years ago, when radiology transformed from film-based to digital departments “and you could have images everywhere at the same time it changed the way radiologists consult in the acute care environment,” he says. Referring physicians no longer had to walk to the radiology department to discuss findings with the radiologists interpreting the study. Radiologists then realized that if they wanted to be what McKenzie calls a “true partner in the care continuum,” they would have to make changes in how they performed their jobs. McKenzie, other health care consultants, and radiology leaders agree that the shift to value-based care has accelerated the need for radiologists to rethink their roles. Image interpretation is and will remain the radiologist’s most valued contribution, says Bibb Allen, Jr, MD, FACR, a diagnostic radiologist in the Birmingham Radiological Group in Alabama and a leading proponent of Imaging 3.0, the ACR’s strategy for moving toward value-based health care. Image interpretation is what radiologists study and practice, and it’s their true area of expertise. However, Allen says, accurate image interpretation is not the only way that radiologists can add value to the patient care equation. Radiologists also can add value to the patient’s care by making sure the right study is ordered and that the right protocol with the lowest feasible dose is used when performing the study, he says. Imaging 3.0 offers tools to ordering physicians to help them ensure that the requested study is the most appropriate and will get them answers to the questions they are asking in the most efficient and effective way, Allen says. Imaging 3.0 includes the ACR’s Appropriateness Criteria, which are evidence-based guidelines to assist referring physicians and other providers in making the most appropriate imaging or treatment decision for specific clinical conditions. Allen believes ordering physicians are clearly understand what they are trying to learn from a test 80% to 85% of the time and order the appropriate exam. It’s for that 15% to 20% of the time, when they are unsure or when they enter the exam order entry system and it triggers a red light rather than a green light in the patient’s electronic health record, that they need to have a discussion with the radiologist—and the radiologist needs to be available to take those calls, Allen says. Starting in 2017, referring physicians will be required to use physician-developed appropriateness criteria when ordering advanced imaging for their Medicare patients, he notes. The requirement is part of the Protecting Access to Medicare Act of 2014, also known as the sustainable growth rate patch. The law does not define what decision-support system should be used, but no imaging experts we’ve talked to think the ACR criteria will be excluded. Monitoring radiation dose is another area where radiologists can add real value to the continuum of care, says Jef Williams, chief operating officer of Ascendian. “There are dose technologies out there to help with decision support,” he says. If ordering physicians were to see that a patient was close to reaching a threshold of radiation that they are not comfortable with, radiologists could be consulted and possibly offer an alternative study that could be done with less or no ionizing radiation, such as a sonogram or MRI. “No other group of physicians is going to understand radiation exposure better than radiologists,” says Allen, who also believes radiologists can add tremendous value to the health system by helping referring physicians reduce or eliminate unnecessary radiation. Patients, too, would appreciate this input, he adds. Radiologists also need to take a seat at the table where decisions for the health care system are made, Williams says. Traditionally, radiologists tended to shy away from meetings where decisions around the care enterprise are made, but as the “eyes of the physician when it comes to a diagnostic perspective,” radiologists should take a central role in discussions about strategies that can affect them, according to Williams. Groups may leave this role to their members who enjoy or are good at it, but someone has to do it, he says. Yet another opportunity for radiologists to show their value is informatics, McKenzie says. “There’s a huge opportunity for radiologists to look at trends and analysis and to take this data and manage it to the benefit of the health system,” he says. If radiologists show their colleagues how this information can be used to improve the care that they provide to patients, their colleagues are sure to see it as a valuable contribution, he says. “It’s a way for radiologists to contribute to better care, better quality, better outcomes, and a better patient experience,” McKenzie adds. Christoph Lee, MD, MSHS, an assistant professor of radiology at the University of Washington School of Medicine and a faculty investigator at the Comparative Effectiveness, Cost and Outcomes Research Center, says radiologists should approach not only their colleagues but patients as well. Sometimes radiologists need to talk directly to referring physicians, and sometimes it’s patients they need to talk to directly, he says. To be seen as adding value, Lee says radiologists must do whatever it takes “to communicate their findings and help direct the patient’s care down the proper cascade.” A radiologist’s effort has to translate into actionable information—the next proper step in a patient’s diagnosis or treatment management, he says. That may mean the radiologists must convince the patients as well as the physicians treating them of their clinical recommendations. “They have to be willing to spend face time with patients to explain the clinical importance of their imaging findings and to clearly and effectively communicate their recommendations to the clinical team based on their image interpretation,” Lee says.